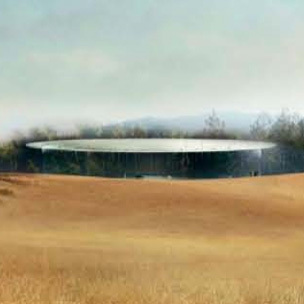 Apple Campus 2 comes with its own detached structure built specifically for media-filled keynote presentations of new products (though I imagine it will be used for plenty of staff events, too). This new theater will seat 1,000, and get this: the auditorium itself will be underground. 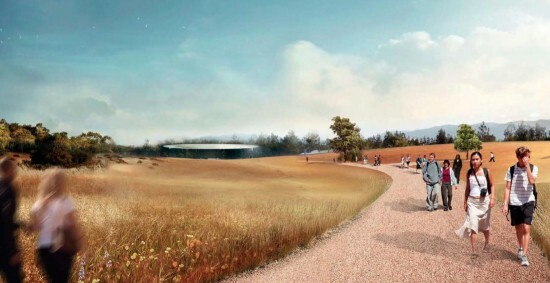 Visitors will reach the underground theater by entering a large, round lobby with a disc-shaped metal roof and circular walls made entirely of glass. As you can see from these artists’ renderings, the resulting structure strongly resembles a slender flying saucer floating in a forest. The lobby also boasts a pair of cylindrical glass elevators, like the one inside New York’s 5th Avenue Apple Store. You can see one of them in the rendering at the top; it’s on the left side next to a staircase. I’m surprised no one’s said it yet: Welcome to Carrousel!